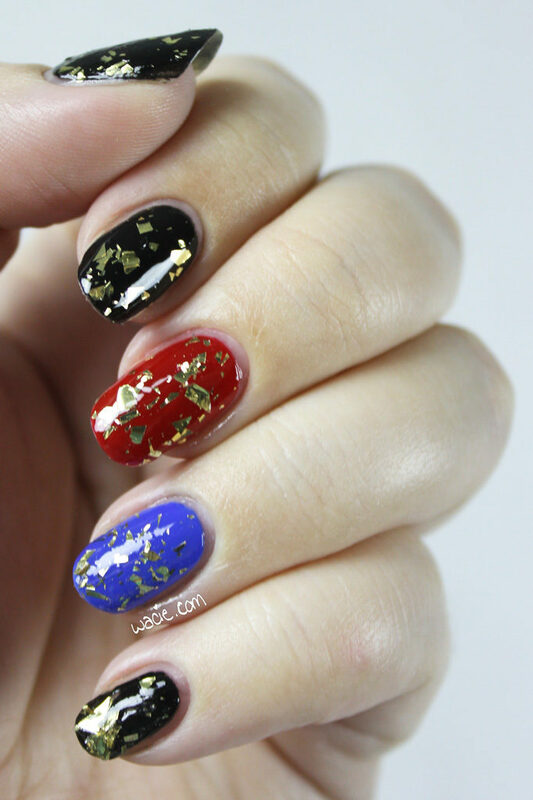 This entry was posted in Swatch Sunday and tagged accent nails, black, blue, glitter, gold, indie, Indigo Bananas, Octopus Party Nail Lacquer, red, Sally Hansen, swatch, The New Black. I think I got a set from one of the online shopping networks (HSN/QVC?) – I loved the set I got but was bummed that they weren’t named either. I love the flakie shards! 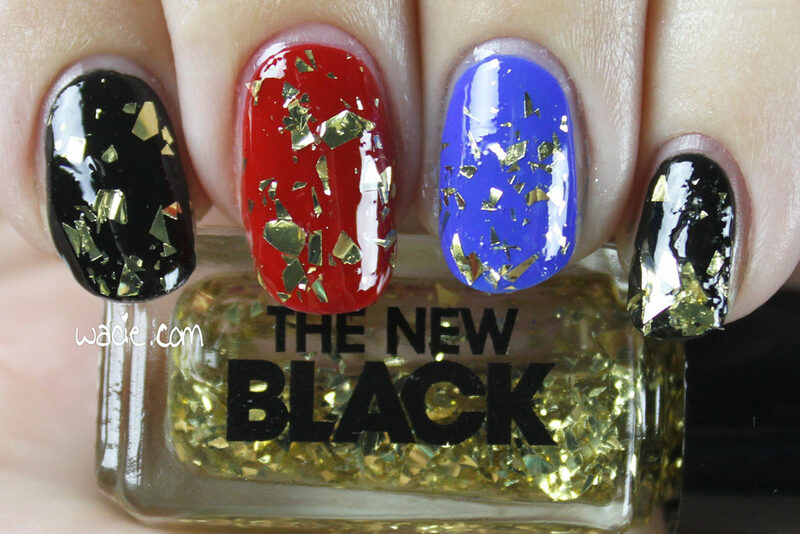 They are super edgy & high fashion with the primary colors & black! so pretty but so pokey. 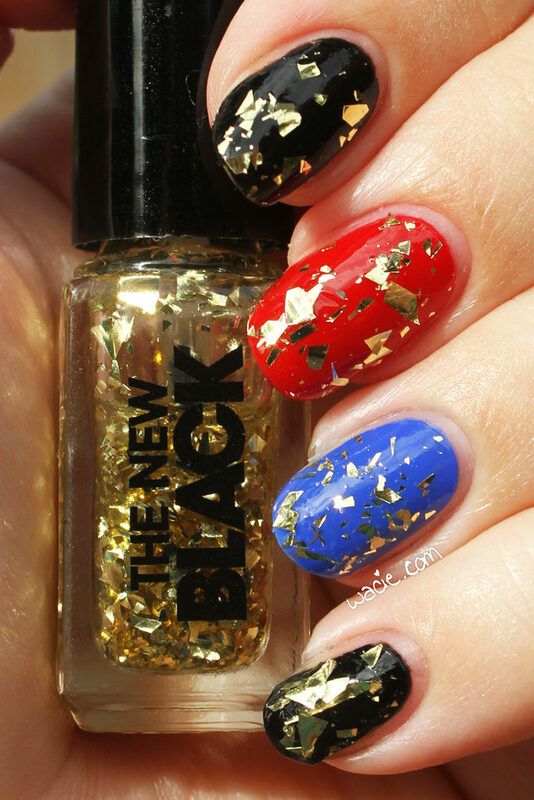 I had this polish once upon a time and I hated having to fish the flakes out. So pretty against black polish too! It is really annoying when they don’t have names. 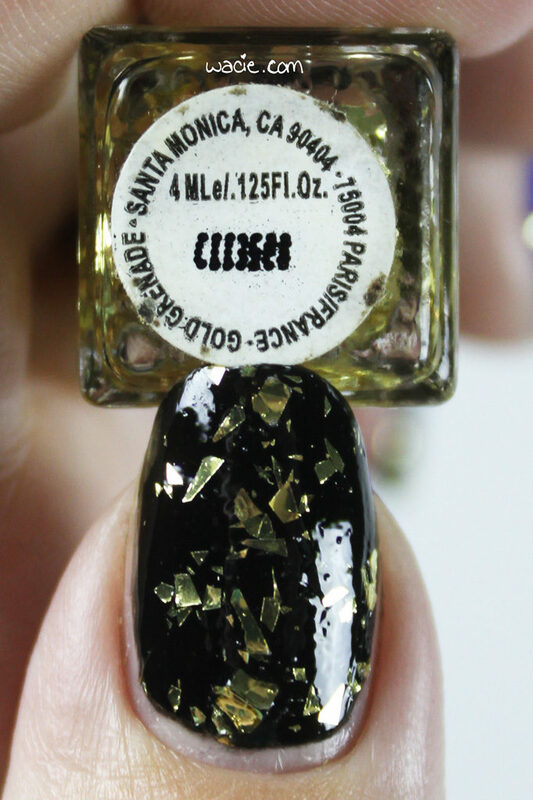 I love all the interesting names brands come up with for polish. 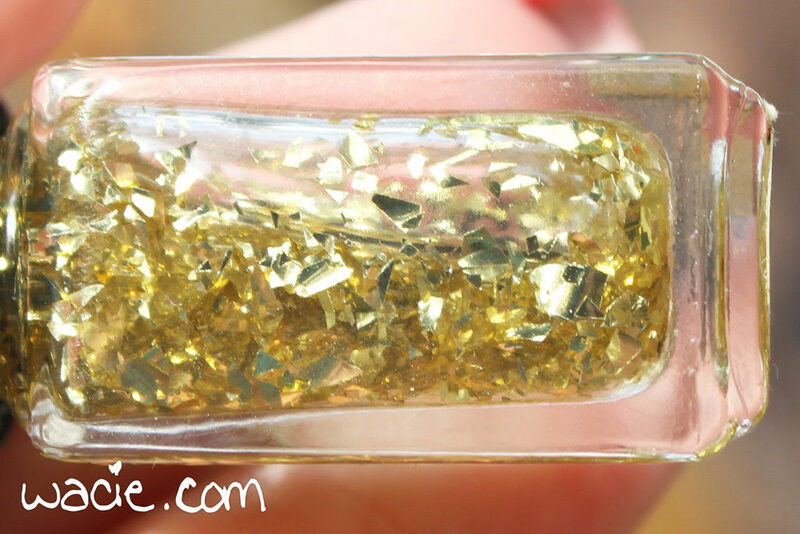 Very glam topper! I love it over all of the bases you swatched with it. Pretty! 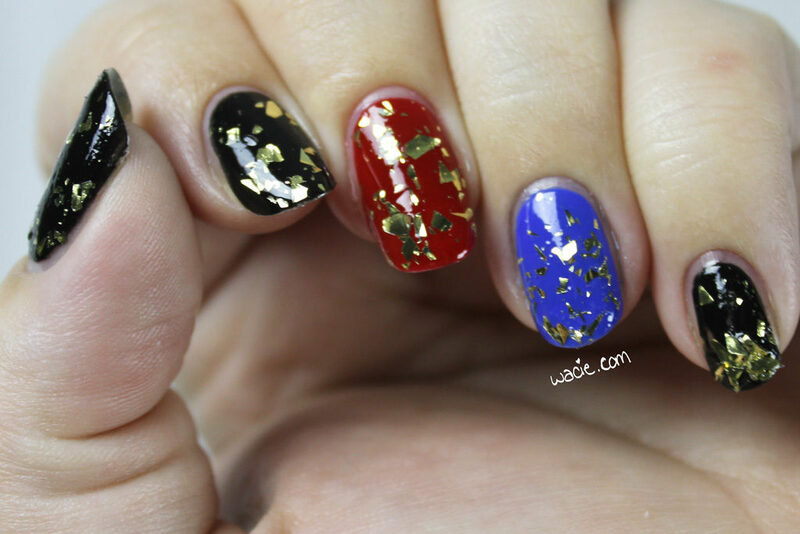 I like the colors you used as a base to show off the gold flakes. No name? Yikes, that would drive me crazy and feel like a polish muggle. This looks like it can be fun to play with for the holidays, if only for a day as the bulky flakes would probably drive me crazy in no time. I have such love/hate with shredded glitter!!!! 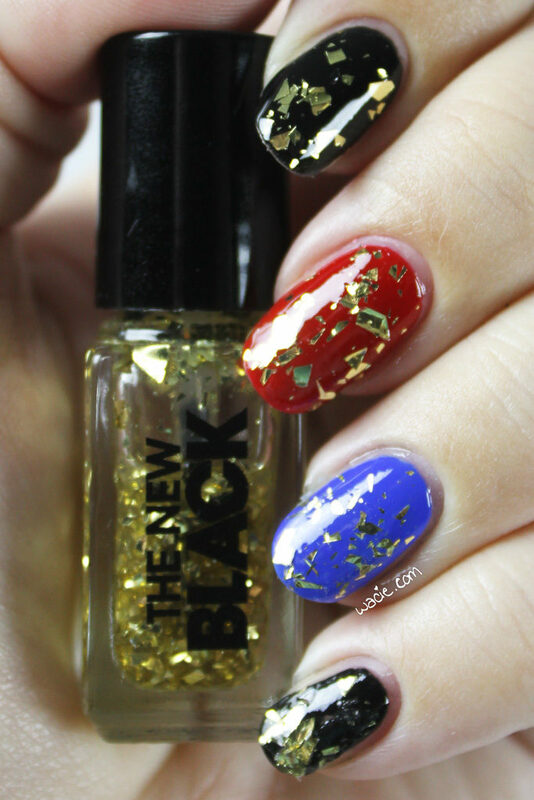 That foil is SO pretty! I lost my only gold foil and never bothered to replace it, but now you make me want to search for it again. Oh! 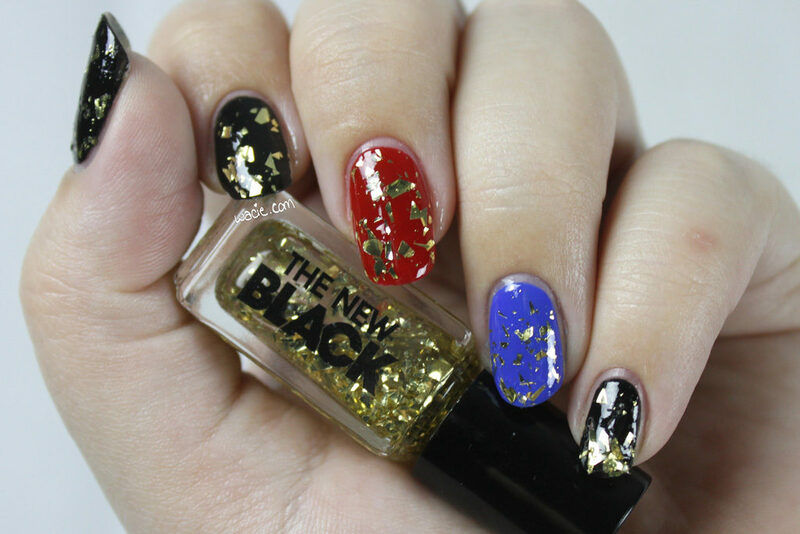 I’ve seen this brand at Ulta before! Although its a shame when polishes don’t have the names, its one of my little pet peeve. It means you get to call it whatever you want! Ohhhhhhh… I am so shocked there are no names. That is so weird!!! 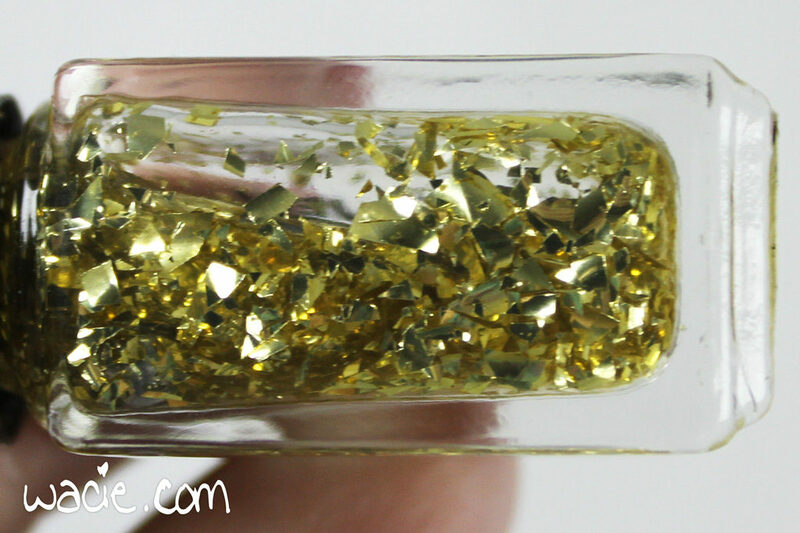 Love the gold flakes – gorgeous! 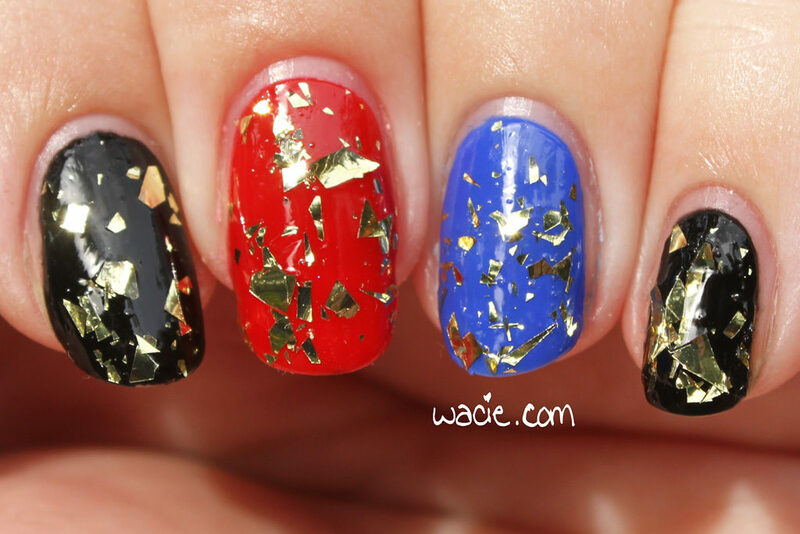 That foil is gorgeous – it actually looks like broken glass! But yeah, I can imagine how poky they must be! UGH I get so frustrated when polishes don’t have names too. If you can’t come up with a name then do numbers. Something to help me remember a polish. 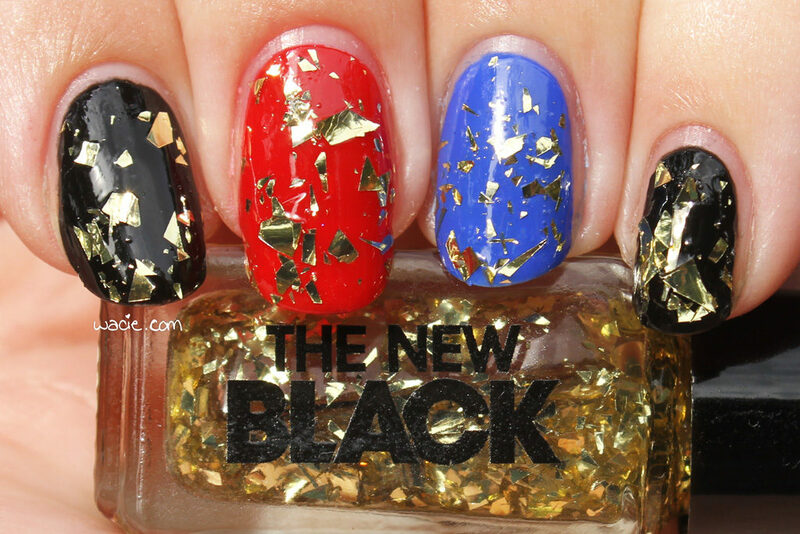 However, this polish is fun and super versatile. I’m glad you showed it over multiple colors. 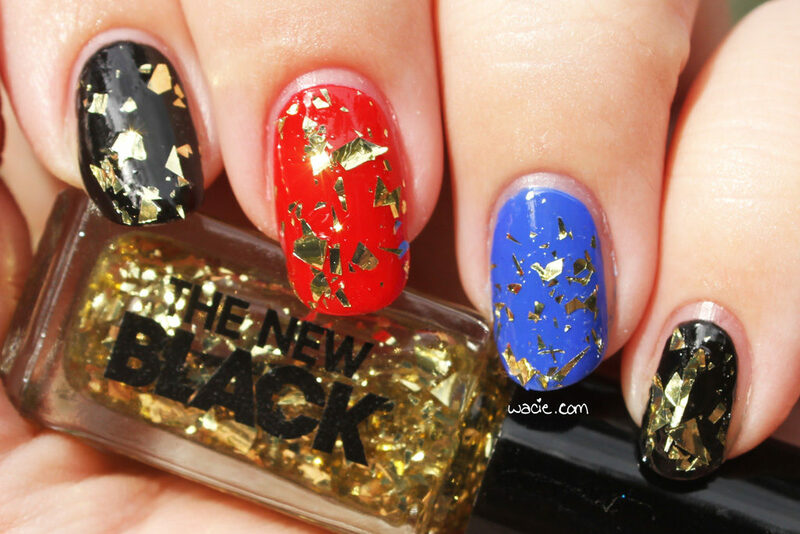 This give such a cool look to the manicure! 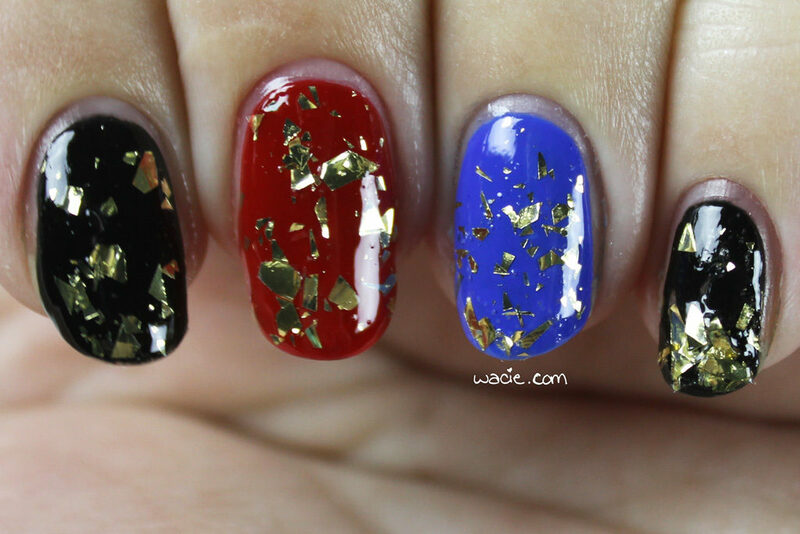 Not sure if I would like this type of polish…but I am tempted to at least try! Cute look but too bad about the larger pieces! I know I would be picking at them like crazy!